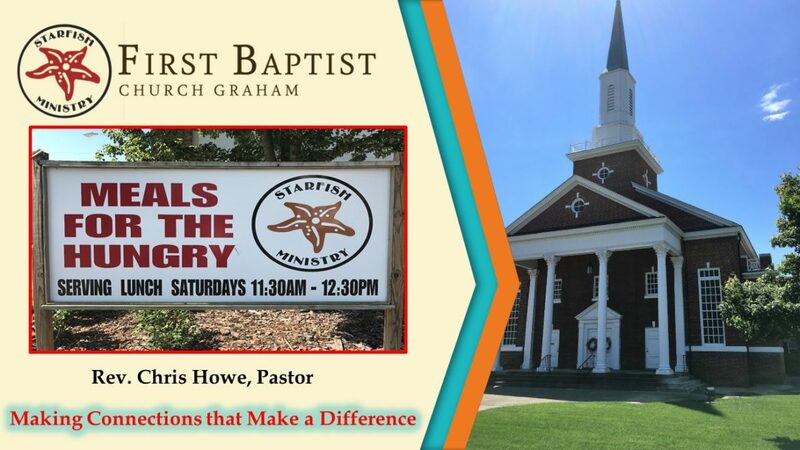 We’re First Baptist Church of Graham, a moderate Baptist church, conveniently located at 224 N. Main Street in Graham, NC. We welcome you to come dressed however you chose – either dresses and coats and ties, or polo shirts, khakis or jeans. We have a great staff, headed up by our Pastor, Rev. Chris Howe. Our Sunday services are conducted at 11:00am. The services are broadcast live on radio stations 920-AM or 104.5FM. We also have a mid-week Prayer Service/Bible Study on Wednesday nights starting at 6:30pm. First Baptist Church Graham has weekly Prayer Service each Wednesday starting at 6:30pm. After the Prayer Service, we have Bible Study at 6:45pm, conducted by our Senior Pastor, Rev. Chris Howe and our Associate Pastor, Rev. Shannon Hall. On some occasions, other ministers in our church and laypersons will conduct the Bible Study. These meetings are held in the Dixie Mann Room in our Main Building but may be held in other locations and will be announced in advance. Come and join us each Wednesday night @ 6:30pm. Dress casual, as this is a casual meeting with opportunities for participation.